On a glorious early October day the rugby matched the weather. The large crowd of well over 600 enjoyed a feast of flowing rugby by both sides. Hoppers possibly had more power and bulk up front, but most of the slick handling at speed came from Wharfedale, some of it from the forwards. Mistakes were of course made, but these were due to impetuosity when “calm it” should have been the cry. Too many bursts of 20 metres or more ended in knock ons or loss of possession. This failure will be put right in training which has never been more relevant or intense. It was clear that the defence this season is very well organised, so necessary when large forwards are hurtling forwards! Wharfedale played uphill in the first half and had to defend manfully. Good wide passing by Hoppers after excellent work by captain Paul Millea and then Sam Stott’s final telling pass ensured that Tyler Spence could speed over in the corner (0-5). An outstanding piece of play by Sam Gaudie, punching above his weight as usual, saw him wrench the ball from three Hoppers forwards and set Rian Hamilton on a successful run to the line from well inside his own half on 14 minutes. He had work to do but easily beat the cover. Jack Blakeney-Edwards converted for his first points for Wharfedale. The home side were then held up over the line before Hamilton scored his second on 16 minutes. Blakeney-Edwards again converted. It was not long before Edward Leatherbarrow, the opposition’s outstanding player, scored. Davidson converted. There were then bullocking runs by Proctor and Birch. They were stopped by more brave tackling, but a Lovegrove/Mann move counteracted this and ended with Gaudie being brought down just short of the line. Dale were penalised and Hoppers swept downfield to score in injury time, again through Spence. The narrow 20-17 half-time lead was well deserved, but there was much to play for. We didn’t want a repetition of our disappointing second half performance against Otley. Within five minutes of the restart, we saw some of Wharfedale’s best play of the match. Cicognini, Mann, Bullough and Gaudie all produced moments of brilliance, having accepted good ball from the forwards, but the impetuosity referred to above meant that another score did not come until the 50th minute when Tyson leapt high at the back of the line out and it was Matt Houghton who scored, aided in particular by Reece Ward (25-17). On 53 minutes Harry Bullough was yellow carded when he jumped for a high ball and four minutes later Alex Ward scored the inevitable try whilst we were down to 14 men. On the hour we nearly scored on the left, but were forced out by an effective cover tackle. A vital steal by Josh Burridge was followed by a great break by Chris Walker at a time when Dan Stockdale had to go off with a cut. Sadly lost possession saw the Greens further back than where they started. On 64 minutes, with Bullough back on the field, an interception of a looped and slightly forward pass saw Hamilton completing his hat trick. Blakeney-Edwards converted. Our last raid resulted in Philip Woodhead, who had come on for Gaudie after 62 minutes, putting Rhys Lovegrove away superbly for the final try, again converted by Blakeney-Edwards. All the forwards contributed greatly to this win; it would be churlish not to mention this in case anyone feels some have been forgotten. Without their hard work, the backs could not have displayed such a variety of skills when on the front foot. The Greens must surely maintain the momentum now. The loyal band of supporters expect nothing less. 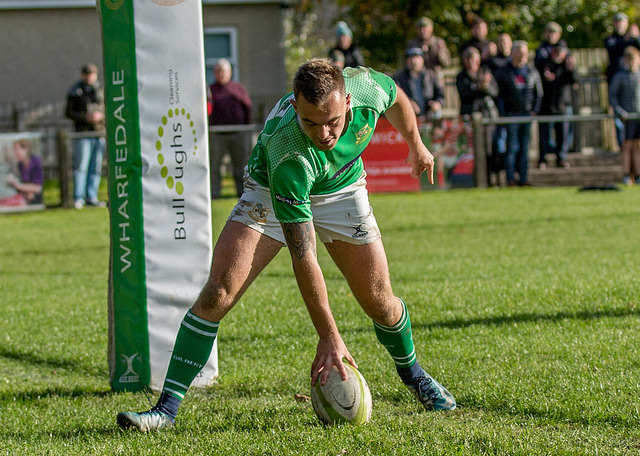 Wharfedale: – Mann, Hamilton, Bullough, Lovegrove, Cicognini, Blakeney-Edwards (Edwards 79), Gaudie (Woodhead 62), Altham (Booker 78), Stockdale (Houghton 64), Ward (Martin 79), Hedgley, Leacock, Houghton (Walker 51), Tyson, Burridge. Wharfedale: – Tries Hamilton (14), (16) & (64), Houghton (50), Lovegrove (78). Conversions – Blakeney-Edwards (15), (17), (64) & (78). Penalties – Blakeney-Edwards (26) & (39). Preston Grasshoppers – Tries Spence (3) & (40), Leatherbarrow (23), Ward (57). Conversion Davidson (23). Referee: – Michael Harris. Attendance: – 627. Star man: – Rian Hamilton.